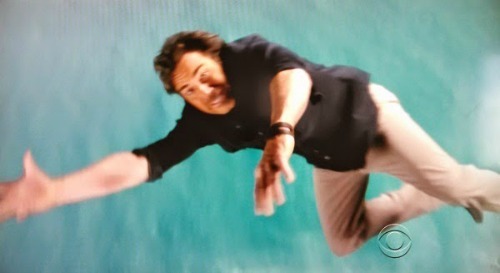 The Bold and the Beautiful spoilers tease that Ridge’s (Thorsten Kaye) arrest for Bill’s (Don Diamont) attempted murder will lead to eventual vindication. While he threatened his enemy, Ridge did not shoot Spencer. So, yes, Bill awakes from unconsciousness with a vengeance. He’ll tap Ridge as the person who most likely shot him. Having had his back turned when the actual shooter aimed and fired, Bill doesn’t actually know who committed the crime. But recent events lead him to conclude that Ridge was the trigger-puller. It’s understandable that Bill believes Ridge took a shot at him. They confronted each other after Ridge arrived, unannounced, at Bill’s home on the night in question. After they got into it, Bill double-punched him. Marone fell to the ground and was dazed. He got up and was glaring at Bill’s golden gun. The longtime combatants spoke about the weapon, but Bill advised Ridge not to try it and he eventually left Spencer’s abode. That sequence of events and Ridge having recently punched Bill in the face naturally makes Mr. Forrester look like the prime suspect in this attempted murder case. Detective Sanchez (Jeremy Ray Valdez) certainly thinks so. Motive, means and opportunity are the standard trio of areas the authorities consider where a crime of this nature is concerned. So, how does Ridge fare? Bill once threw Ridge out of a helicopter and recently slept with his married daughter, Steffy (Jacqueline MacInnes Wood). So motive exists. He had the means to shoot Bill, based on the referenced gun, or the awareness of that piece gave Kaye’s character an idea. He later returned with another gun and used it. Opportunity existed to shoot Bill because Ridge knew he was alone after being with him earlier. Interestingly, when Ridge confronted Sheila (Kimberlin Brown) about Bill’s shooting, she claimed he (Ridge) was guilty. That surprised him. As B&B viewers recall, Ridge told Sheila to kill Bill if she really wanted to help the Forrester family. He made that statement at Ill Giardino after having a public spat with Spencer. Knowing her history, instability and desire to help Eric’s (John McCook) family, it stands to reason that Sheila could have done the deed. She wouldn’t want to take the fall for a crime she didn’t commit. So her reaction to Ridge’s assertion was likely defensive. Following this logic, she would then be removed from the suspect list. The Bold and the Beautiful Spoilers: Courtney Hope Reported Off Contract – Sally and Spectra Gang to Exit? The Bold and the Beautiful Spoilers: J.R. Ewing Resurrected – Was Bill Shot, or Did He Stage Attempted Murder to Frame Ridge?